CWB – USA artist Brendon Gawel writes about the ways that identity intersects with regional politics during CWB’s tour to Lebanon. Hannah and I are on this tour as part of Clowns Without Borders. It’s organized and run by a Lebanese theatre company called Clown Me In. Clown Me In has company clowns, along with guest performers from a project called We Must Clown. We Must Clown trains brand new performers and gives them a chance to clown for their communities. They receive training from Stephen Sobal of the UK company All In Theatre. 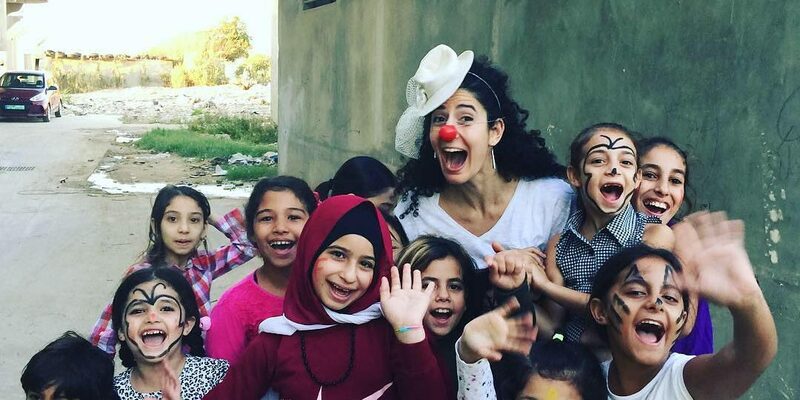 We Must Clown-ers are from disadvantaged communities all around Lebanon. They’re Palestinian, Syrian, and Lebanese. Many of the places we go to on this tour are the very communities they live in. Some people don’t have the right papers. Some days, some of our performers can’t be in all of the shows…simply because there’s a checkpoint along the way. One clown—let’s call him Frank—was a We Must Clown artist from last year. Now he’s a Clown Me In company clown! He’s from Syria. While we’re in rehearsals, he receives word that his wife and newborn son made it safely back to Syria. This is good news amidst bad news. They don’t want to be separated, but his wife and child can’t stay here in Lebanon and Frank can’t go back to Syria, or he’ll be drafted into the Syrian army. Yet he carries on, bringing resilience through laughter to others. There are layers and layers of borders, operating all around us. I’m away from my wife and kids too, but thanks to my papers, which get me past checkpoints, I’ll see them in a couple of weeks.